As a follow up to Monday night's Channel Center Impact Advisory Group (IAG) Meeting, attached, please find the Community Benefits Chart, which has been updated, as well as the IAG's 2001 comment letter. The IAG requested that their comment letter be shared with the attendees from the IAG meeting as well as the attendees of the November 15, 2010 BRA-sponsored community meeting. Also, Mike Casey, the IAG member who is no longer active on the IAG, was nominated by the Mayor's Office of Neighborhood Services (ONS). ONS will nominate a new individual to replace Mike Casey on the IAG. Please note that the BRA Board Meeting on Tuesday, December 14, 2010 will begin at 4PM instead of at 5:30PM. The time change is due to the large number of agenda items. Therefore, the public hearing regarding this phase of the Channel Center Project will be at 4PM. BRA Board Meetings are held on the 9th floor of City Hall, in Room 900/BRA Board Room. Everyone is welcome to attend and speak at this hearing. 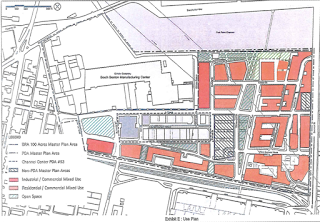 And, as mentioned at the IAG meeting, there will be a public hearing for this phase of the Channel Center Project at the Boston Zoning Commission (BZC) on Wednesday, December 15, 2010. The BZC meeting will begin at 9AM. BZC hearings are held on the 9th floor of City Hall, in Room 900/BRA Board Room. Everyone is welcome to attend and speak at this hearing.